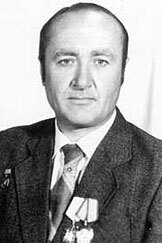 2 July 1990: At 10:20 p.m., Pacific Daylight Time, Anatoly Demyanovich Grishchenko, Honored Test Pilot of the Soviet Union, and test pilot at the M.M. Gromov Flight Research Institute, Zhukovsky, Russia, died at the Fred Hutchinson Cancer Research Center, Seattle, Washington, United States of America. 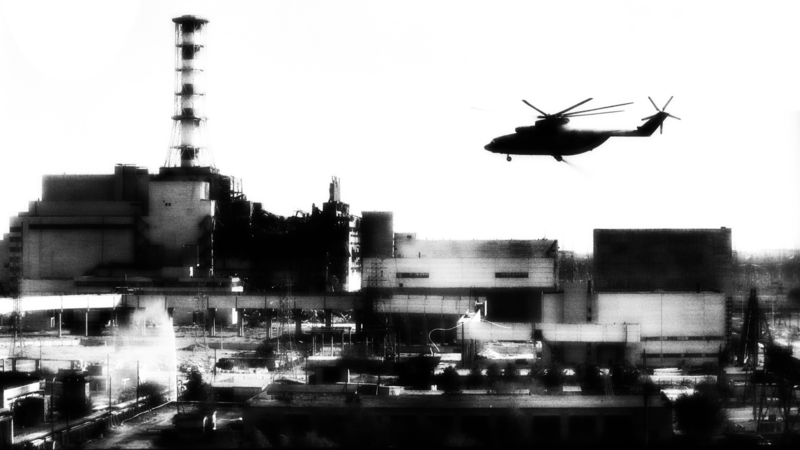 A Mil Mi-26 flies over Chernobyl complex, April 1986. Grischenko suffered from radiation poisoning and later, leukemia. Four years later, Grischenko, along with his wife Galina, was brought to the Fred Hutchinson Cancer Research Center, in Seattle, Washington, for medical treatment, on 11 April 1990. He underwent chemotherapy and radiation treatments to destroy his own bone marrow. A 42-year-old woman from France had donated her marrow, which was flown directly to Seattle by British Airways. Grischenko received the marrow transplant during a 7-hour procedure on 27 April—4 years and 1 day after his first flight over Chernobyl— but shortly thereafter, he contracted a lung infection. On 12 June 1990, exploratory surgery was performed to find the cause of the infection. His condition worsened and he was placed on a respirator, but died on the evening of 2 July 1990. On the Fourth of July, Independence Day, the most important holiday in America, national flags in the city of Seattle were lowered to half-mast to honor the memory of the heroic, self-sacrificing test pilot from Zhukovsky. His remains were returned to Russia and buried at the Bykovskoe Memorial Cemetery, Zhukovsky, Russia. Following his death, the Flight Safety Foundation honored Grishchenko with the FSF Heroism Award, symbolized by the Graviner Sword. On 27 February 1995, Anatoly Demyanovich Grishchenko was posthumously awarded the Gold Star of Hero of the Russian Federation by President Boris Yeltsin. 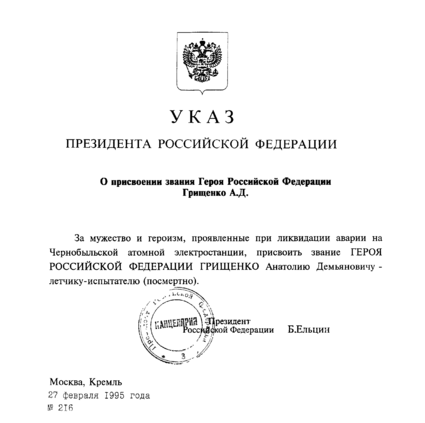 Award of Hero of the Russian Federation. 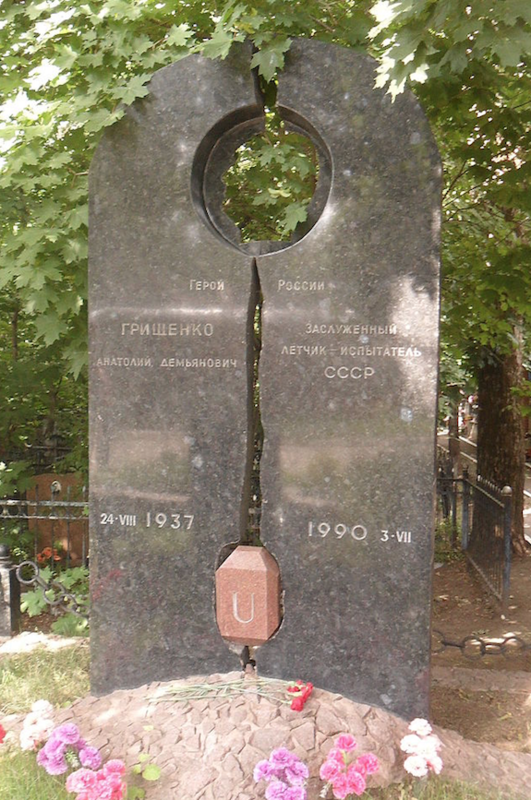 Анатолий Демьянович Грищенко (Anatoly Demyanovich Grishchenko) Memorial at Bykovskoe Memorial Cemetery, Zhukvsky, Russia. Анатолий Демьянович Грищенко (Anatoly Demyanovich Grishchenko) was born in Leningrad, Russian Soviet Federative Socialist Republic, 24 August 1937. His father was there attending the S.M. Kirov Military Medical Academy. On completion of his course of studies, the family returned to the Ukraine, where they were caught up in the Nazi invasion. He grew up in Lutsk, Lyubomi and Kovel, towns in Volyn Oblast, Ukraine. Grishchenko began flying at the Central and Egoryevsky flying clubs in 1955. In 1959, he graduated from the Moscow Aviation Institute. From 1959 to 1965, he was an engineer at the M.M. Gromov Flight Research Institute. He graduated from the Fedotov Test Pilot School in 1966. Grishchenko served as a test pilot at Gromov until 1987, and as an instructor at Fedotov. Anatoly Grishchenko married Galina Melekhina. They would have two sons. 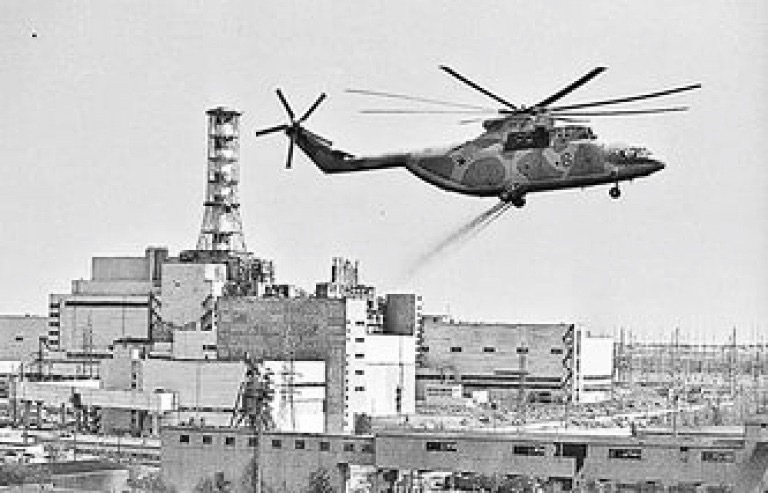 Mil Mi-26 dropping sand mixture at Chernobyl, 1987. 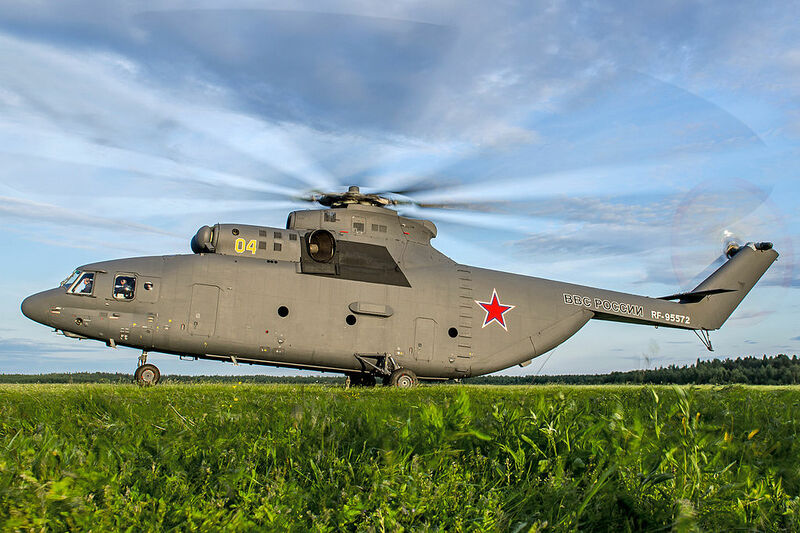 The OKB Mil Design Bureau’s Mi-26 is the world’s largest helicopter. It is a twin-engine, single main rotor/tail rotor helicopter with fixed tricycle landing gear. It is normally operated by two pilots, a navigator, flight engineer and flight technician, and can carry as many as 90 passengers. The Mi-26 has an overall length with rotors turning of 40.025 meters (131 feet, 3.8 inches) and height of 8.145 meters (26 feet, 8.7 inches). The main rotor has a diameter of 32.00 meters (104 feet, 11.8 inches). The helicopter has an empty weight of 28,200 kiograms (62,170 pounds) and maximum takeoff weight of 56,000 kilograms (123,459 pounds). The eight-blade fully-articulated main rotor system turns clockwise at 132 r.p.m. (the advancing blade is on the left). A five-blade tail rotor is mounted on the right side of a pylon in a pusher configuration. The tail rotor turns clockwise as seen from the helicopter’s left side (the advancing blade is below the axis of rotation). Power is supplied by two Lotarev D-136 turboshaft engines producing 8,500 kW (11,399 shaft horsepower), each. The cruise speed of the Mi-26 is 255 kilometers per hour (158 miles per hour) and maximum speed is 295 kilometers per hour (183 miles per hour). The hover ceiling, out of ground effect (HOGE), is 1,800 meters (5,905 feet), and the service ceiling is 4,600 meters (15,092 feet), though on 2 February 1982, test pilot Gurgen Karapetyan, who flew with Grishchenko at Chernobyl, flew an Mi-26 to 6,400 meters (20,997 feet) carrying a 10,000 kilogram (22,046 pound) payload.¹ The maximum payload is 20,000 kilograms (44,092 pounds). The helicopter’s range, carrying an 18,000 kilogram (39,683 pounds) payload is 670 kilometers (416 miles). The Mi-26 first flew in 1977. Production began in 1980. The helicopter remains in service with both military and civil operators.